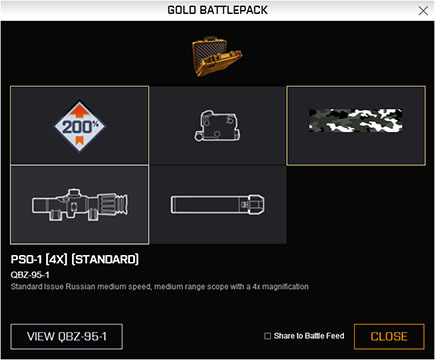 Before I began the purchasing flow for BF4, I knew only that they had recently introduced the ability to purchase Battlepacks. During the checkout flow in Origin, they presented an upsell for the Ultimate Shortcut pack. As I was modeling the behavior of a high spending player, I decided this was exactly the sort of item I was likely to buy before jumping in to the battlefield. To answer my questions about what was inside all these kits, I left the Origin store and was able to find a Gamersgate purchase page that listed all the items in these various kits. This was partially helpful: at least I had a list of items I was about to purchase. But item names only go so far. There is a difference between knowing that I will acquire the JNG-90 sniper rifle and knowing why it is worth purchasing, or how a Recon Scout Spec will help me catch up to players who have invested months in BF4. In both the instance of the Shortcut Kit and the Gold Battlepacks, BF4 did not go far enough to inform me what I was about to buy and why I should want this digital content. This lack of upfront knowledge when making the purchases contributed to the disappointment felt later on when it started to look like I had wasted my money on these IAP. Video is a fantastic tool for informing consumers and pumping them up on a purchase. Each of the 11 kits could have a hype video that explains what is contained inside. For instance, a single line of VO explaining what style of play is enhanced with the Assault Offensive Spec or the Assault Grenadier Spec will go a long way to informing my purchasing decision. For a bundle like the Ultimate Shortcut Kit, a quick video explaining the content with links or embedded videos for each kit further in the sales page would do the job. For each item the player can purchase, they should be able to watch a video within the Origin store that explains what they get for their money and why they would want those items. During my session as a high value player, I spent $60 on sets of Gold Battlepacks. These packs were disappointing on a number of vectors. One that is clearly in need of improvement is the unboxing process. Perhaps the king of digital content unboxing is Hearthstone. Opening a card pack in this game feels awesome. The process is interactive and fulfilling, chock full of animations and effects both upon opening the pack itself and when uncovering a rare or legendary card. If you have not experienced it for yourself, watch this video of a player opening an incredible pack with two legendary cards or just skip ahead to the part where he gets to the legendary cards. It is clear the amount of effort Blizzard put into making sure that the core element of monetization, opening a card pack, was fun and rewarding in its own right. Contrast that experience to BF4. On PC, I open the pack by clicking a link on the Battlelog web interface. It then pops up a fairly bland dialog box showing the 5 items I received. It took me too many packs to recognize that the thin, gold outline was an indicator that I had received items at a high rarity tier. This pack should make me as excited as the player in the Hearthstone video above: I received two gold level items in a single pack. Later I would learn that the 200% xp boosts are the most valuable thing I bought and that a rare camouflage was meaningless at my skill level. But despite my disappointment at the items themselves, a more interactive and inspired unboxing feature would make me feel more positively about my purchases. Battlefield 4 needs to take a page out of the Hearthstone school of unboxing. Opening up a Gold Battlepack needs to be interactive and exciting; I should feel awesome each time I receive a Superior quality item. 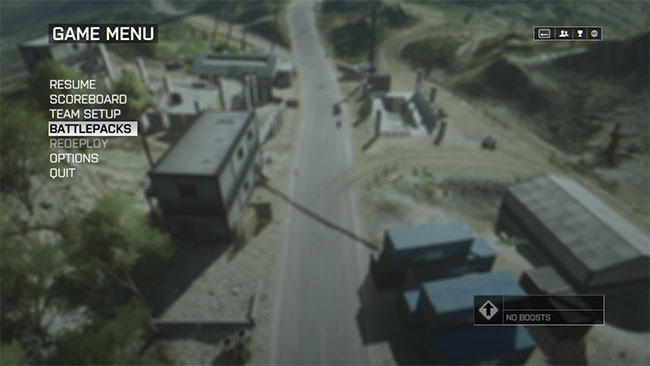 Battlelog required a plug-in to access so it is possible that an unboxing module could be built into the webpage itself. More likely, the player should open their Battlepacks in game. The unboxing module does not need to be Peggle fever mode level of over-the-top particle explosions, but opening a pack should be a moment that is celebrated. 3. Dude, where’s my stuff? Once I had opened my 30 Gold Battlepacks, I entered the game for the first time. I was disoriented, as hitting Play on the Origin client opens up a webpage for the Battlelog instead of a game client as I was expecting. I got over this fairly quickly, but faced an immediate issue. I did not know where all the stuff I spent my money on was. First, as I had never opened the game before, I did not know which guns and items I would unlock by default and which I had purchased. Since there was no celebration of items I had purchased in game, and I still saw plenty of locked items, I had to resort to Google to make sure my items had in fact been granted. Part of this is due to what may be a bug. A number of premium items I had purchased were not accessible until I had completed a first round of multiplayer play. If this choice was intentional, it is quite frustrating, as I had spent money to avoid progression roadblocks. Similarly, I wanted to start using my XP boosts right away, but could not figure out how to activate them. Again, I had to resort to Google to figure out where boosts are accessed. These are the most valuable thing I bought, and the sort of item that should be present in the core loop of gameplay to entice players to purchase more Battlepacks. Instead of being built into the troop deployment screen the player sees multiple times every round, my Google search revealed that I had to hit escape to open up the Game Menu where boosts were accessible. At the very least, if this boosts widget is hidden off the core loop of play, the game ought to teach me how to access that widget and activate a boost after I have earned one for the first time. 36.67% of all items I unlocked in my Gold Battlepacks were purely cosmetic, and figuring out how to equip them was similarly obtuse. Some items, like gun paints and camo, are available when outfitting my soldier. 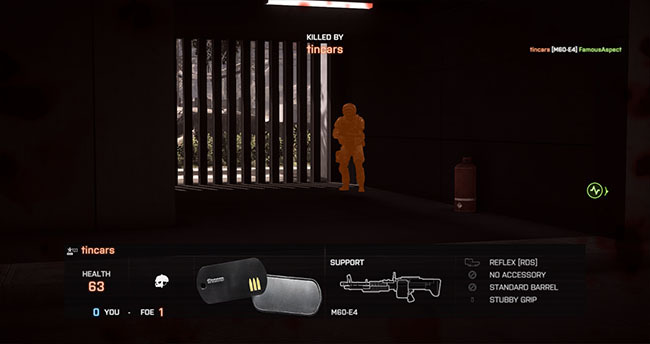 Some items, like dog tabs and emblems, are available only through the Battlelog interface. As it tries to accomplish a lot, the Battlelog UI is complex and I still have not figured out where I am able to equip one of the 9 portraits I unlocked. Some items I understand being hidden off the main path. As a portrait does not greatly affect the play experience it does not need to be part of the core loop. But the boosts specifically, the single item that would most incentivize me to buy a Battlepack in the future, need to be present in the core game loop. 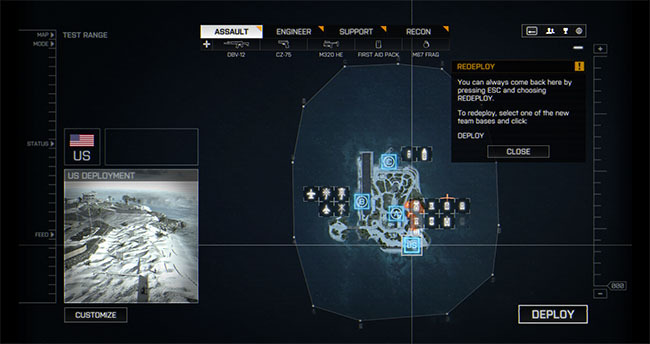 This is as simple as moving the boosts widget from the Game Menu to the deploy screen I see multiple times during every round of BF4. Both in game and in the Battlelog, BF4 needs to do more with UI to enable me to use and equip my items, and to celebrate those items the first time I see them. Anything that I have acquired through additional spend should be clear and easy to use. What is the point of equipping rare vanity items if another player cannot see them? As mentioned in the previous section, over a third or all items I acquired in Battlepacks are vanity items. Beyond being difficult for the owner to equip, they are also difficult for other players to recognize. When mowed down in combat, I do see my assaulter’s gun, dog tags and emblem. I see an outline of my killer highlighted in orange. If in my hours of play I was ever killed by another player with rare camo or gun paint, I did not know it. Perhaps camo has a functional effect at higher levels of play where characters can blend into the background better with the appropriate items equipped. At my level of play, camo and paint felt decorative, not functional. The lack of vanity item surfacing made me feel as though a third of the money I spent on Battlepacks was thrown out the window. What is the point of vanity items if other players do not get jealous of them? Vanity items will be more meaningful if they are surfaced to opponents. I understand the functional reason for the orange highlight of an opponent; I can become a better player over time if I learn where players are hiding on a map when they kill me. However, a brief, 3 second freeze frame close up of my opponent (perhaps posed/configured in the Battlelog) will give a player the chance to show off their character and personal style beyond emblems on a dog tag. 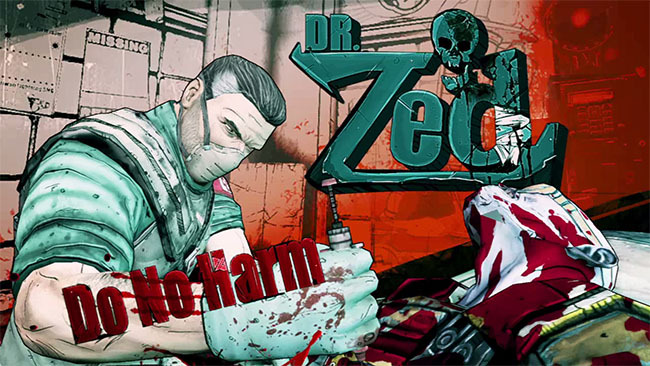 If I were to design this feature, I would take inspiration from Borderlands’ excellent character introductions. A module that allowed me to customize my vanity shot would not only make purchasing Battlepacks more meaningful, but like the Madden Giferator, it could give players something worth sharing with their friends on social media to raise BF4 awareness. In spending $60 on Battlepacks, I acquired 43 functional gun accessories in the form of scopes. At my level of play, scopes in general did not provide much of a meaningful boost to my performance. I understand the urge on Dice’s part not to allow the purchase of items that give a direct stat advantage. However most, if not all, of these 43 accessories went completely unused because I did not earn “superior” rarity accessories for guns I was using, and I had no way to exchange these unused accessories for ones I wanted. This reinforced the feeling throughout my experience that money spent on Battlepacks was money wasted. Going back to Hearthstone, cards can be disenchanted for a currency that can be used to purchase specific cards. This way, every card in a purchased pack has value even if it is a duplicate. The ability to junk certain scopes for currency that allows me to buy scopes I want would not completely alleviate my disappointment with them, but it would mitigate my negative feelings about this purchasing experience. Battlefield 4 is undoubtedly a great game, and I enjoyed my time playing immensely. But purely from an IAP point of view, I did not enjoy my time spending additional money. Role playing as a high spending player, I largely left with a sour taste in my mouth. Just because I am a free-to-play advocate, does not mean I think BF4 needs to take steps towards the pay-to-win tactics common in many IAP games. But I do believe that by helping players make more informed purchasing decisions, improving the UI/UX presentation of IAP elements and clearly surfacing those IAP items to players, the game would make me feel more positively about having spent money for extra content, and more likely to spend that money again in future entries in the series.